Millet is a wonderful addition to your cooking repertoire whether you’re looking to add more whole grains or simply looking for a rice swap. Get a perfect pot of millet every time with just a few simple steps. In a dry skillet, toast the millet for about two minutes. Add the water (or vegetable broth, if using), olive oil, and the salt. Bring to a boil, reduce to a simmer, cover, and cook for 16 minutes; until most of the water is absorbed. Remove from heat and let sit for 10 minutes. Remove the lid and fluff the millet before serving or using. Store leftover millet in the refrigerator for up to a week or stash cooked millet in the freezer for up to three months. This recipe is perfect for cooking millet as a grain. 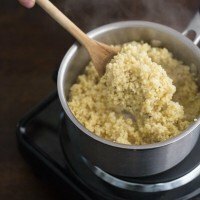 Want to cook millet for porridge or polenta? Check out the instructions here.